so filling & FULL of vitamins & nutrients! 1 lb Brussel Sprouts, rinsed, trimmed, & halved lengthwise. 2 Tbsp extra virgin olive oil or melted coconut oil. 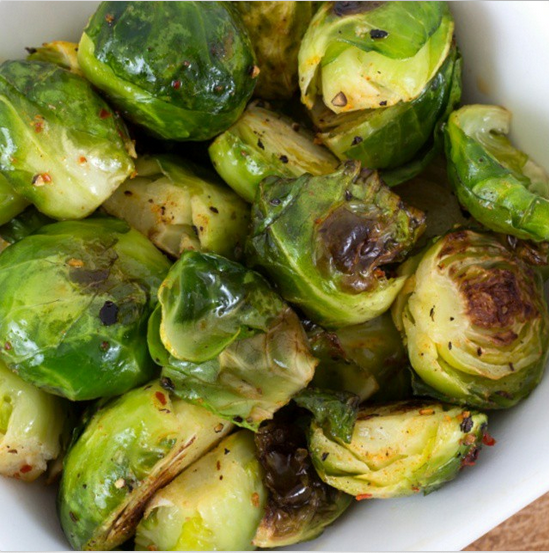 Toss Brussels with all ingredients on a flat rimmed baking sheet. Roast, stirring at least once during cooking time. I love it when several of the leaves begin to crisp up on the outside, & the inside is tender. 30-35 minutes. Tonight I sprinkled them with Flavorgod lemon & garlic seasoning. Remember to treat yourself to dessert!